I’m always looking forward to October. It’s usually quite a dry and beautiful month and the colours are amazing. Unfortunately the beautiful autumn leaves don’t usually last long here in the west – a couple of seasonal gales and they are gone. This talk will help you prepare for the next growing season. Good planning is half the work done. 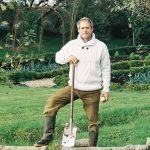 Tips on how to bed down the garden for the winter, improve soil fertility and develop a crop rotation. Klaus will help you choose suitable crops and varieties and how to make a sowing plan for the following year. October is the month to fill your larder. Many crops are harvested and stored safely for the long winter months. It’s also the month to put your beds to bed for the winter. 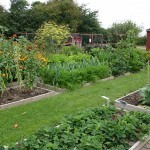 As the ground becomes vacant after harvesting crops you can put the beds to rest for the winter. A thick cover of fresh seaweed is ideal. If you can’t get any seaweed you should either cover the beds with strong black plastic or grow an overwintering green manure crop. The most efficient method is to prepare the beds and work in some compost and then cover the beds securely with black plastic. You will have very little work to do in the following spring. It is advisable to get as much of this work done before the weather turns unpleasant. Stake tall brassicas such as kale, Brussels sprouts and purple sprouting broccoli to prevent them from rocking and collapsing in the wind. You may think it’s far too late to sow any vegetables so late in the year. 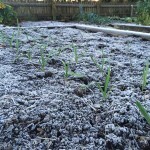 In actual fact it is the ideal time to sow your overwintering broad beans and to plant you overwintering garlic and onion sets. Just make sure that you use suitable varieties. 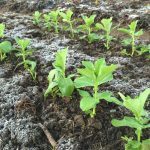 October is still a good month to sow green manures. You can sow grazing rye, vetch and field beans. Harvest all your maincrop potatoes. Dig them out carefully, let them dry for an hour and then store them. Never wash them before storage. You can also dig out your carrots and beetroot and store them in boxes of damp soil in a frost free shed. The firm Dutch cabbages should also be harvested and stored in a cool shed but not in sand/soil. 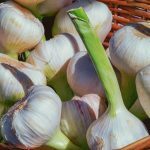 Celeriac, parsnips, leeks, savoy cabbage, kohlrabi, perpetual spinach and swede can be harvested as required. They can be left outdoors as they are very hardy. However, if your ground becomes very waterlogged in winter you better dig out your parsnips, swedes and celeriac at the end of the month and store them in boxes indoors. The first Brussels sprouts may be ready by now. The runner beans are probably finished by now. After your last picking you can clear the plants. It helps if you chop or cut the stems before putting them on the compost heap. If you leave the roots in the ground the nitrogen rich nodules will stay in the ground. – Carrot Rocket F1 – My favourite carrot variety with the best taste. Can be sown in October in the greenhouse for harvesting in spring. Alternatively sow indoors in Feb/March or outdoors in April/May. 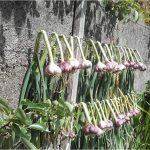 – Onion sets – Troy – A reliable, disease and bolt resistant onion variety suitable for autumn planting both outdoors and under protection. Produces perfectly round-shaped bulbs. Yacon is really one of my favourite vegetables to grow. It originates in the Andes and was one of the lost crops of the Incas. It is closely related to the dahlia and produces large edible tubers that even resemble dahlia tubers. In a tunnel or greenhouse it can grow into a large plant and produces a very high yield of sweet tasting tubers that can be eaten raw or cooked. Even outdoors it grows very reliably even in Leitrim. It could become one of the new superfoods as its carbohydrates are not stored as starch but as inulin and could thus play an important part in a diabetic’s diet. Apparently yacon leaves were used by the Incas as toilet paper. Yacon requires a free draining, fertile and well balanced soil and should be grown in full sun. Yacon can only be grown from stem tubers. Yacon plants have two types of tubers – very knobbly ones that cluster around the stalk and beautiful, large, smooth and succulent tubers that grow outside of the knobbly ones. Obviously the smooth succulent ones are for eating and the knobbly ones for propagation. The knobbly tubers can be separated in the dormant season and provided that they have a growth point will make a new plant. Each part should be potted on into a 1 or 2 litre pot depending on the size of the tuber using good potting compost. The pots should be placed in a cool unheated but frost free shed over the winter and from early April (or as soon as growth start) placed into the greenhouse bench or a south-facing window sill in the house. The plants can be planted into the tunnel or greenhouse around late April or in May outdoors. The plants grow huge with a spread similar to a courgette plant and a height of about 1.5 to 2 metres. Apart from regular watering there is no additional maintenance required. You should leave the plants in the ground until the first frost has killed of the leaves. The tubers seem to grow a lot during the end of the season so the later the first frost, the higher the yield. The yield of tubers can be truly phenomenal and no other vegetable can match it. In one year I got 8 tubers each weighing nearly a pound. Carefully dig out the whole plant and remove the smooth succulent tubers and use them immediately or store them in moist sand in a frost-free shed. What is left is the knobbly part of the plant. Store that in a bucket of moist sand or soil in a frost-free shed. This can be split up in the following spring and you can give some new plants to your friends. The tubers are delicious raw and cooked. When eaten raw they have a surprisingly sweet taste. When cooked they remain crunchy and can be used as a potato alternative. They are also delicious roasted. One of the advantages of ‘new’ vegetables is that they are often free of any specific pests and diseases (the potato was grown for centuries in Europe without blight!). Apart from the occasional slug nibble on the leaves they grow completely healthy. To my knowledge there are no named varieties of yacon. We have a very small number of yacon plants available now on our website. Each plant has a few growth points. When the plants arrive pot them on into a 1 or 2 pot and keep in a cool but frost free shed. As soon as growth starts in spring place the pot in a sunny place (greenhouse or south-facing windowsill) and plant into the greenhouse in mid April or outdoors in May. An eye-opening documentary on how agricultural land can be restored and how communities can live in connection and mutual respect with the land. This link is thanks to Cleo de Vita – member of People4Soil campaign and the Mayo Organic Group.An eye-opening documentary tells of barren lands transformed by local residents. Could this restoration point towards an easy method of carbon capture?